In the annals of corporate audacity, there are few companies with the boastful verve of Chipotle Mexican Grill. The company is one of the largest fast food chains in the world, with a market capitalization of over $20 billion, and explosive 1000% growth over the past five years. Yet it still maintains the image of a local stand at a farmer’s market. And while its CEO Steve Ells has established a corporate motto – Food with Integrity – that paints a picture of idyllic farms and happy workers (even going so far as to “promise to run our business in a way that doesn’t exploit animals, people or the environment”), the company has been challenged repeatedly for labor abuses, environmental problems, and horrific mistreatment of animals. There are, in short, divergent views on the company. On the one hand, the animal rights group I work with – Direct Action Everywhere – has an international campaign focusing its ire on Chipotle’s corporate abuses. On the other, major mainstream periodicals such as the Los Angeles Times vociferously defend the company as “doing better” than other chains. So what, exactly, is the truth? Is Chipotle more similar to the farm stand on the street corner… or a brutal business empire? While the mainstream media has historically accepted Chipotle’s glowing small-town image, that has begun to change. The environmental and food writer, James McWilliams, pointed out in The Atlantic that a Chipotle burrito, despite its clean and healthy image, is probably worse for human health than a Big Mac. The progressive magazine Mother Jones questioned the accuracy of the company’s food labels and marketing claims. And earlier this year, Salon published a scathing article, Don’t buy the Chipotle hype: There’s no such thing as “humane” slaughter, that points out fundamental contradictions in the company’s humane marketing. As an organizer for the grassroots animal rights network Direct Action Everywhere (DxE), I have a vested interest in unmasking the Chipotle’s dark side. But while Chipotle’s mass torture and killing of animals – the focus of DxE’s campaign – is indeed an atrocity, even those who have less empathy for animals should be deeply disturbed by the company’s practices. Here’s why. 1. The “Values Integration” Strategy: Chipotle is leading the way in a deceptive form of corporate marketing that tries to change, not just purchasing decisions, but your basic moral values. The problem with Chipotle, then, is not just that the company wants you to buy its premium-priced meat. It’s not even that it wants to have an honest debate about the practices, such as eating animals, that it so massively profits off of. Rather, the most troubling thing is that Chipotle wants to convert consumers to its moral values without those same consumers even knowing that they are being manipulated. If you are skeptical of corporate values, this sets a dangerous precedent for, not just food issues, but all of American politics. 2. The “Save the World” Mentality: Chipotle steals the stories – and momentum – of genuine progressive movements to feed a particularly brutal form of American capitalism. First pioneered by Apple’s spectacularly successful Think Different campaign which featured icons of social justice such as Martin Luther King, Jr. and Gandhi, Chipotle’s “Save the World” strategy turns a company’s customers into its biggest adherents – essentially, unpaid marketing staff. It also actively undermines attempts by progressive movements to build true coalitions against corporate abuses. Two Stanford psychologists first pointed out this effect many years ago in the context of individual behavior – so-called moral credentialing – but that research has recently been expanded to corporate behavior. The companies most ostentatiously interested in promoting their social responsibility are often the companies with the most vile things to hide. Enron and BP are the most glaring examples of corporations that adopted this strategy (until they pushed things too far, causing their empires to collapse in a house of cards). But Chipotle, perhaps more than any other company, has perfected the “Save the World” mentality. Rather than avoid or confront moral criticisms of the company, Chipotle attempts to twist those criticisms into praise. A former Chipotle kitchen manager, who had been with the company for over two years , worked at three locations, and was praised as a rising star by management, came to one of our open meetings after being jolted by one of DxE’s disruptive protests in the Bay Area. The former employee – we’ll call her “Jane” to protect her anonymity –had some shocking accusations of borderline criminal behavior by the company, including firing employees for becoming pregnant, secretly changing employee time entries to ensure that they did not reach full time or overtime status, and ruthlessly pushing crew members to work faster and harder (in an effort to reduce costs) to the point that many would break down in exhausted tears. For example, at one of Jane’s stores, which served almost 1500 meals daily, corporate would push the crew to limit kitchen staff to a merely two people. That’s right: two people, to make 1500 meals in a single day. “There are unrealistic expectations that cannot be physically met. The pressure that corporate puts on these people is horrible,” Jane said. Every time Jane or co-workers would come forward to district managers with complaints, they would dismiss the criticisms. “It was odd to me because there were all these scandalous things that didn’t make any sense, but the district manager didn’t do anything about it,” Jane said. Even more strangely, company management would divert and twist employee concerns into the supposedly good things the company was doing for its workers, e.g. offering opportunities to become “managers” (a title given to every employee other than the lowest minimum-wage crew member, and which had trivial pay increases of 50 cents or less) or to obtain pay raises that were often as low as 10 cents—but celebrated as huge sacrifices by the company. “The company makes the dumbest and most insignificant things seem like the best things ever. And you would be ungrateful for not loving them,” Jane said. If the employee’s criticisms were not mollified by this Orwellian re-framing, the company would turn on them. In the case of the crew member who discovered and reported to higher-ups that workers hours were being secretly deleted to ensure that they wouldn’t be paid overtime, for example, the company – perhaps realizing that there was no room to manipulate the employee’s complaint into something good – decided to simply fire the employee. And through it all, Chipotle continues to maintain its sterling public image… because it made a promise to never exploit its workers. The company has done the same with the animal rights movement. By contributing millions of dollars to sustainable food and animal welfare causes, praising (and receiving praise from) national animal rights non-profits, and offering consumers a vegan burrito, the company believes that it has immunized itself from protest or even criticism. Indeed, it’s gone even further than that in procuring zealous allies within movements for social justice. “Chipotle is not hurting the world. It’s saving the world. And anyone who cannot see that is an enemy of progress,” they say. Our organizers, for example, have been viciously attacked by the company’s defenders within our movement – primarily, adherents or employees of major animal rights non-profits (though some of them may well be corporate plants). The corporation’s defenders have used terms like “brain dead”, “alarming,” and “ridiculous” – the sort of vitriol usually reserved for, well, violent mega corporations – to attack our grassroots campaign, and even described our peaceful and nonviolent demonstrations as an “assault” on a supposedly good company. In short, the “Save the World” mentality is not just brilliant marketing. It actively co-opts and pre-empts activist movements in posing an effective challenge, not just to an individual company, but to entire systems of corporate abuse. 3. “Conscious Consumerism”: Chipotle is leading the charge in defense of American consumerism. This shift away from consumerism, however, contradicts the legal purpose of a corporation: to maximize profits. And so, as people in Europe and Asia have drifted towards a more conscious and worker friendly form of social democracy, corporations in America have fought back by offering a capitalist alternative: conscious consumerism. The operative notion behind this philosophy? That we can buy our way to a better world. That we can switch from one set of products of industrial capitalism, to another, and achieve the just and sustainable world that has so far eluded us. This, of course, is a fantasy, as consumerism is a culprit, not a savior, in the world’s problems. But consumerism continues to dominate the narrative of too many social justice campaigns, despite overwhelming evidence that consumerism has been a complete failure as a movement building strategy. But that is precisely what Chipotle is offering: Integrity, sustainability, and justice, not via the hard methods that social justice activists have used for thousands of years — efforts such as education, community building, and direct action – but rather by… buying stuff. In short, Chipotle is bad, not just for the tens of millions of animals it tortures and kills, but for progressive America. 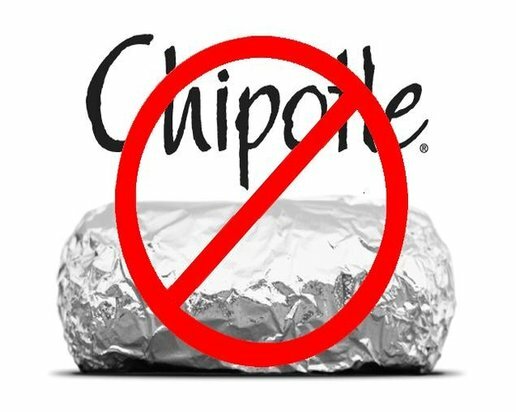 If we allow Chipotle and its ilk to succeed – at manipulating our values, stealing our stories, and transforming our most important social justice movements into self-indulgent buying sprees, we will have lost, not just this particular campaign, but progressive America’s very soul.